The story of how Willard quit smoking is legendary in our family. He had started smoking as a teenager in the 1950’s, picking up the habit while working as a caddy with his friends. They would hide cigarettes in a haystack where they could pick them up on their way to the golf course. By the time he was a young professional, married and working as an economist, cigarettes had become a constant accessory. They dangled from his mouth or from his hand whether he was at work, at home, in the car, out with friends, or elsewhere. His addiction eventually had him smoking up to a pack and a half a day. And then something changed in his life. One evening, 40-some years ago, Willard came home from work to be greeted by his wife with confirmation that she was pregnant with their first child. Now, the average smoker has to make four or more attempts to quit before they are able to kick the habit for good. He decided that very night. He would stop smoking. And then he followed through. Despite strong cravings that continued on and off for years, he never picked up a cigarette again. He had a good reason: Willard didn’t want his child to grow up breathing smoke and thinking that smoking was an ok thing to do. But many people set goals or make resolutions for very good reasons, and yet they don’t manage to follow through. What was different about Willard? That’s actually something I’ve contemplated a lot over the years. You see, Willard is my dad. And I am the child whose impending birth prompted him to give up smoking. It wasn’t just the smoking thing. He’s excelled over the years at motivating himself to take all kinds of admirable actions — to save money, maintain a healthy weight, build muscle, lower his cholesterol, advance his career, build his vocabulary, etc. And for a long time, I thought it was just a strength he possessed and I didn’t. I never seemed to be able to exert the same degree of self-control. But as a psychologist, I’ve learned that willpower isn’t something you either have or you don’t. 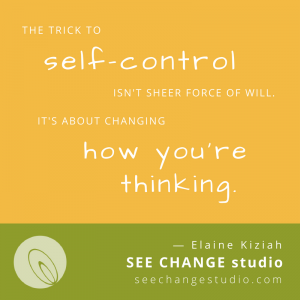 While some research suggests willpower may be a muscle you can build through regular use, the real trick to Willard-style self-control is not sheer force of will. It’s about changing the way you’re thinking. Adopt one of the three mindsets I describe below, and you may find yourself transformed from a “willpower weakling” to a superhero like my dad. preventing ourselves from taking undesirable actions (i.e., resisting temptation). Kelly McGonigal, author of The Willpower Instinct, calls these two things “I will” power and “I won’t” power. It’s that simple. And really tough if you go about it the wrong way. What does it take to win the “willpower” battle? Turns out it’s not about force of will. Instead, it’s largely a matter of mindset. Time perspective is the degree to which you focus on the past, present, or future in a given situation. People like my dad, who we tend to think of as having tons of willpower, are actually people with a very strong future “goal-oriented” time perspective. Too much of a focus on the future, though, and you’ll sacrifice important things like family time, friendships, hobbies, sleep, etc. So the best approach is to be flexible in your time perspective. Adopt the one that will provide you the best outcomes in a given situation. And when you want to get yourself to do something that will be good for you in the long run, that means switching to a more future-oriented perspective. What’s the secret to developing a future orientation? Be explicit about what it is you’re aiming for and why it’s important to you. Paint a vivid picture for yourself. Write it down. Make it a good ol’ SMART goal (specific, measurable, attainable, relevant, time-bound). Create a plan for how you will get there. Then take steps to make sure you’re forced to be frequently thinking about your goal, vision, or plan. Post it on your wall. Write milestones on your calendar. Talk about it regularly with your friends, family, and colleagues. Schedule a weekly check-in with yourself — or better yet, with someone else! — to assess your progress. Do whatever you need to do to keep a clear vision of your desired future in the forefront of your mind. Second, distract yourself so you forget about temptations in the present moment. If you watched Phillip Zimbardo’s TED Talk about time perspectives, you heard him describe Walter Mischel’s classic “marshmallow experiment” with pre-school aged children. The kids were told they could have a second marshmallow only if they waited several minutes before eating the first one. The children who were most successful in waiting were the ones who figured out how to distract themselves so they temporarily forgot about the highly tempting marshmallow in front of them. So do whatever it takes to get your focus off of the thing you’re craving and back onto your desired future vision or accomplishment. Even if you’re focused on the future, you’re unlikely to act in your long-term interest if you don’t believe your actions will make a difference. To be a willpower superhero, you should think like an optimist. In his outstanding book, Learned Optimism, Martin Seligman highlights the many personal and professional advantages enjoyed by people who use an “optimistic explanatory style” to interpret the causes of the things that happen to them. The good news is that people who develop a strong future orientation tend to think more optimistically. First, practice recognizing and disputing negative thoughts when they come up. Challenge yourself when you start putting yourself down or being pessimistic about your chances of success. And finally, consider keeping a gratitude journal — a daily list of things that have gone well for you, so you can help yourself tune in to the positives and possibilities in life. How you explain things to yourself matters. And it particularly matters how you explain the causes of your own behavior — i.e., your “theories of the self”. I want to highlight — and debunk — a couple of common theories here. One is a myth about how motivation works. Most of us believe that we need to find some way to motivate ourselves, and once we do, then we will take action. But as Linda Sapadin (author of It’s About Time!) points out, the reality is that motivation follows from action. I wasn’t motivated to start writing this very article. So I told myself I could stop after 20 minutes if I still felt unmotivated. But about five minutes into my task, I realized I was feeling completely engaged and motivated — writing is fun! — and so I kept going. The other theory I want to debunk relates to willpower itself. Many of us believe that willpower is a limited resource — that if we use it while completing a difficult task or resisting a temptation, we’ll have less of it available to draw upon when it comes to our next task or temptation. Others of us view willpower as an unlimited resource. We see the effective use of willpower as a personal win that generates energy, momentum, and greater capacity for subsequently using willpower to our advantage. Whatever you believe here, it turns out you’re right. That’s because your theory of willpower is a self-fulfilling prophecy. Research by Veronika Job and her colleagues has shown repeatedly that people who have a limited theory of willpower tend to run out of willpower when faced with a series of difficult tasks or temptations, whereas people with an unlimited theory of willpower do not. Become aware of the way you’re currently thinking and the impact it has on you. For the next week or two, allow a small part of your brain to watch yourself as you go about your day. Not judging. Just noticing. How sat­is­fied am I with my “I will” and “I won’t” power today? What do I want to do more of? Less of? When was I at my most effec­tive? What about the sit­u­a­tion or my own thoughts seemed to con­tribute to my effectiveness? What undermined my efforts to follow through on my intentions? What have I learned about myself today that can help me as I go forward? Jot down any key insights that arise. You can use them to coach yourself into a more helpful mindset. Then go public with your intention. What important goal are you working toward? Click below to post your commitment on social media. And then pick one thing you will do to develop a mindset that will support you in achieving your goal. With the support of those who care about you — and that includes me! — you can become a willpower superhero.